Now it is time to show you our second official eKameno plugin. 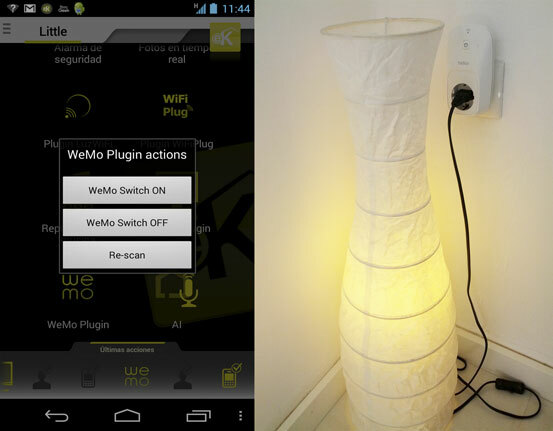 This plugin allows you to control any electrical device connected to the WeMo switch. IMPORTANT: Firstly, you should have eKameno system installed in your devices in order to use the WeMo plugin, if it is the case check this page. 1.You can buy WeMo switch wherever you want and also in the following manufacturer’s page. 2.Set up WeMo wifi configuration using the WeMo App. If you want more information about the wifi configuration process you can check out the following link. 3.Place the WeMo switch in a power plug inside your home, then connect the electrical device that you want control to the WeMo switch. For instance you could connect to the switch a coffee maker, lights or heater. 4.Install eKameno WeMo Plugin in your eKameno Nodo device. Restart the eKameno Nodo Device. At that point the system will detect all the available WeMo switchs and you will be able to use them. Be sure that the WeMo device is powered on when you restart the eKameno Node device. 5.Run the eKameno App in the eKameno Remote device. You can switch on and switch off every single device connected to the WeMo switch as you can see in the post picture. This is the easiest way to create your home automation system and the easiest way to control Internet of things. Try it now and tell us about your experience!